Let's cut through the rhetoric: The 2017 Camaro SS 1LE, which starts at $44,200, is quite likely the quickest car you can buy for under $50,000. It's not a car for everyone, and that doesn't matter in the slightest, because the list of cars it rightly competes with in terms of its capabilities is a veritable who's who of premium-priced performance cars: the Jaguar F-TYPE SVR, BMW M4, even the Porsche 911. The 1LE is a halo car that you just need to know about, whether or not you have any intention of buying one. It's a feather in Chevrolet's cap, built more to highlight the company's vast engineering prowess than to appease a general audience driving sedans painted in Ambivalent Beige. On the road, the 1LE is the equivalent of a unique bottle of wine: unknown to the masses, but a sight to behold for the learned few. Yes, I'm fully cognizant that I'm talking about a Camaro in terms of rare wines, but hey, if the Cubs can win a World Series, Camaros can be compared to wine. 2016 is a strange time, and just to make it even stranger, there's a cheaper and less powerful V6 version of the 1LE that just might be more fun -- but more on that later. 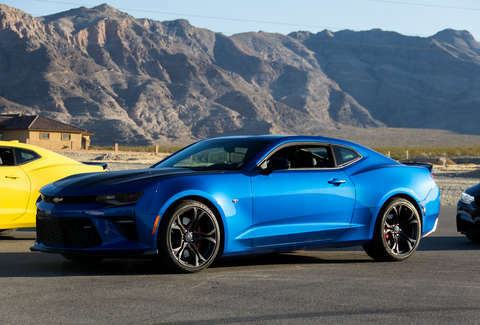 Under the matte black hood is the same 455hp engine you'll get in the regular Camaro SS, but we're not here to talk about the car's 0-60 time (4.2 seconds). You might find yourself thinking, "OK, great. Why is this car $6,500 more than a regular SS if it doesn't even have more power?" To really understand it, you have to go to a racetrack, where the SS 1LE is silky smooth, thanks to a fancy, magnetically adaptable suspension. Without getting too technical, it keeps the car calm at all times, never letting it bounce around or feel unsettled in the slightest. The resulting stability means you never have to fight the car or worry about what it's about to do, which means it's very easy to drive very quickly. In short, Camaro's engineers managed to find that special combination of poise and finesse that was once the sole domain of BMW's vaunted M3. The 1LE isn't adorned with a dozen badges declaring itself to the world, so to spot one in the wild you'll have to know what to look for. The hood is matte black, and the front and back each have aerodynamic bits developed in the wind tunnel to help keep the car affixed to the road at triple-digit speeds. In the V8 version, beautifully large brakes haul the car safely from speed as often as you'd like. But the 1LE keeps a lot of its serious abilities under wraps, at least visually. There's a bunch of additional cooling capacity hidden away in the front of the car -- and that might sound boring, but it's the kind of thing that keeps a car running after the kind of abuse doled out in a performance environment. Case in point, GM ensured the 1LE passed what it calls a "24-hour test." Think of it like a stress test for cars: GM's test drivers take turns flogging the car around a track for 24 hours, and are only allowed to refuel and change tires and brake pads. As you're driving down the highway, that same suspension that works wonders on the racetrack yields a smoother and more composed ride on the road. In this instance it really is a case of having the best of both worlds. Normally, a production car's seats, even "sport" seats, aren't up to the task of holding you in place should you find yourself compelled to partake in the type of driving for which the car was originally designed. That's not the case here, though. The Recaro seats -- standard on the SS, optional on the V6, but totally worth it -- actually hold you in almost perfectly. The optional Performance Data Recorder ($1,300) is a must. A bit of trickle-down tech from the Corvette, it's a built-in camera that'll record straight to an SD card at the touch of a button on the infotainment screen. It overlays everything you're doing with the car, from brake use to steering angle. Even if you never go on track, it'll act as a dash cam, let you know exactly what your parking valet was up to, and give you the chance to totally geek out on your own driving data, if you're into that kind of thing. If you do use it for performance purposes, you'll be rewarded with a car that can literally teach you how to go faster. There's only one real problem with the SS 1LE. It's a fantastic performance car, but it's possibly not even the most fun 1LE. The V6 version (starting at $32,895) is in many ways more entertaining to drive than its V8 brother, with its lighter engine and better balance transforming it into what you'd call tossable. Whereas the SS can be driven with surgical precision, the V6 simply fits like a glove. It doesn't come with the fancy suspension or brakes, so while it's a car that still helps you find the limit with relative ease, you actually have to work with the car to get there. Aaron Miller is the Cars editor for Thrillist, and can be found on Twitter and Facebook. He thinks the V6 1LE is good enough to justify a 1LE version based on the four-cylinder. Chevy, we know you're reading this. Make it happen.